What next on the agenda? Fake polio vaccination CIA style? THERE is not much sense of employment pride among examiners (i.e. scientists) working for Battistelli. The EPO is so full of abuses at so many levels (usually behind a cloak of secrecy as there’s no true transparency) that it has become an abundant gold mine for disappointing if not outrageous news where people are routinely incentivised to cheat and defraud, including last year's 'Inventor of the Year' award finalist Elizabeth Holmes. 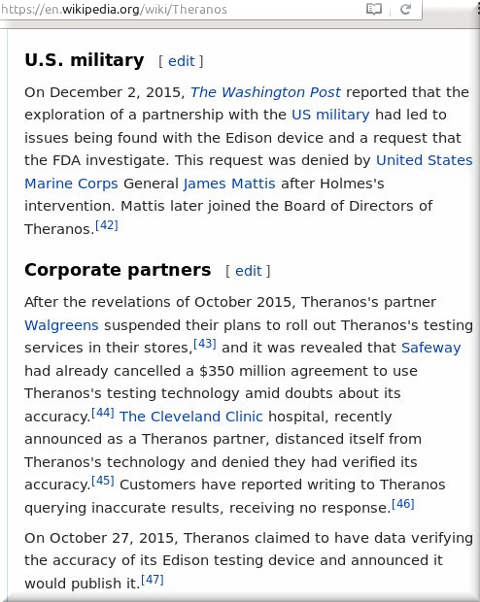 Elizabeth Holmes, as we noted here before, turns out to have allegedly run a dangerous scam and for the EPO to affiliate with her proved to be an expensive political exercise (costing several millions of euros and corrupting the media in the process, just as Holmes had done). “What do incumbent players in the blood-diagnostic space think about all of this? The most frequent criticism is that Theranos is using purportedly breakthrough technology to perform tests that are relied on for life-and-death decisions without having first published any validation studies in peer-review journals. “I don’t know what they’re measuring, how they’re measuring it, and why they think they’re measuring it,” says Richard Bender, an oncologist who is also a medical affairs consultant for Quest Diagnostics, the largest independent diagnostic lab. Patents on a scam granted.